I’ve been pretty busy recently, mostly looking after two small (but fabulous) small children and training for the Melbourne Marathon in October, so my baking has slipped somewhat. I opted out of last month’s challenge and was considering doing the same for this month’s until I realised that it was the perfect chance to make the sour cream ice cream from Alice Medrich’s book Pure Dessert. This recipe had been calling to me ever since I first saw it, which is odd as I don’t generally eat sour cream or ice cream. 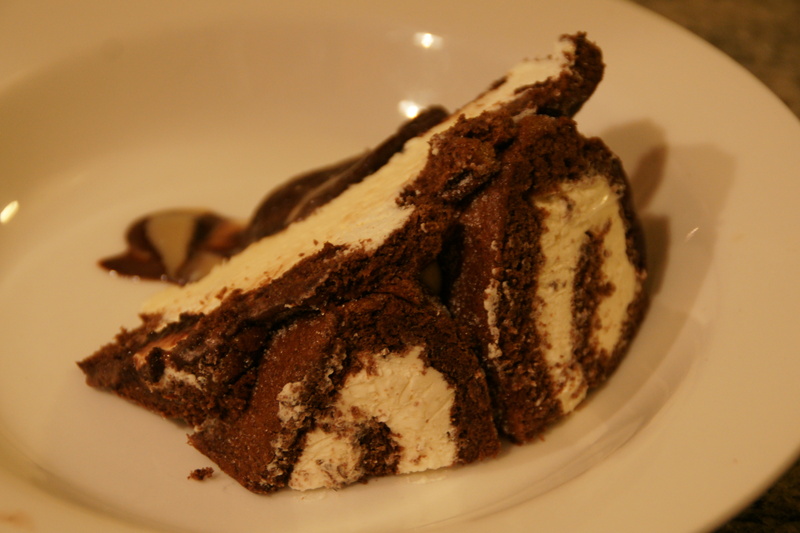 Sunita included recipes for chocolate and vanilla icecreams, along with a chocolate fudge sauce. I chose to team the sour cream ice cream with an intense cocoa-based sorbet and a milder cream-based caramel sauce. Spread a kitchen towel on the counter and sprinkle a little caster sugar over it. 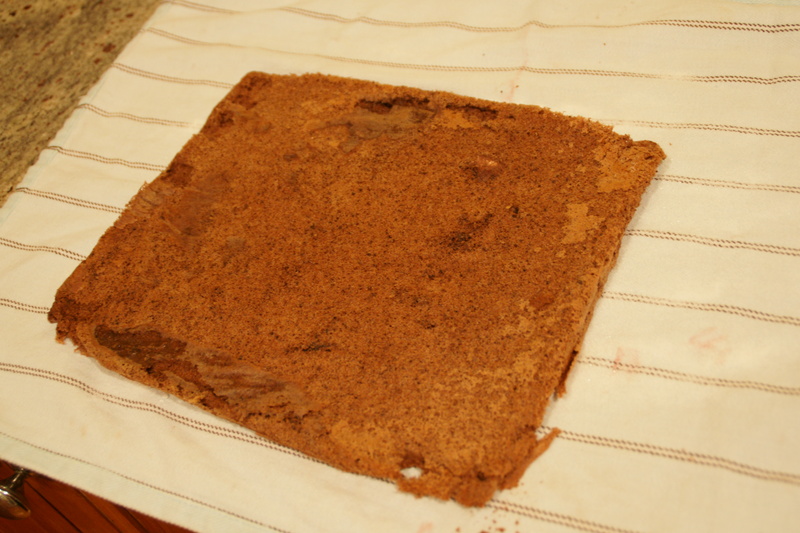 NB – I found that the cake stuck to the teatowel so I would suggest using quite a bit of sugar. In a small saucepan, combine the sugar, cornflour and salt. Whisk in a little of the milk until smooth, then whisk in the remaining milk. Whisk constantly over medium heat until the mixture is warm and foamy. Continue to whisk until the foam subsides and begins to boil. whisking constantly, boil steadily for 1.5 to 2 minutes or until mixture thins slightly. Take the pan off the heat and whisk for a few seconds to release some heat. A little at a time, whisk the hot mixture into the sour cream. Cover and chill 12 hours then churn. Combine the cocoa, sugar and salt in a heavy based saucepan and whisk in about 1/2 cup of the boiling water to form a thick paste. Whisk in the remaining water. Stir over medium heat until tiny bubbles start to form around the edges of the pan. At this point, take it off the heat and stir in the milk and vanilla. Transfer to a bowl, cover and refridgerate until cold – at least 4 hours. Churn using icecream maker or by hand. 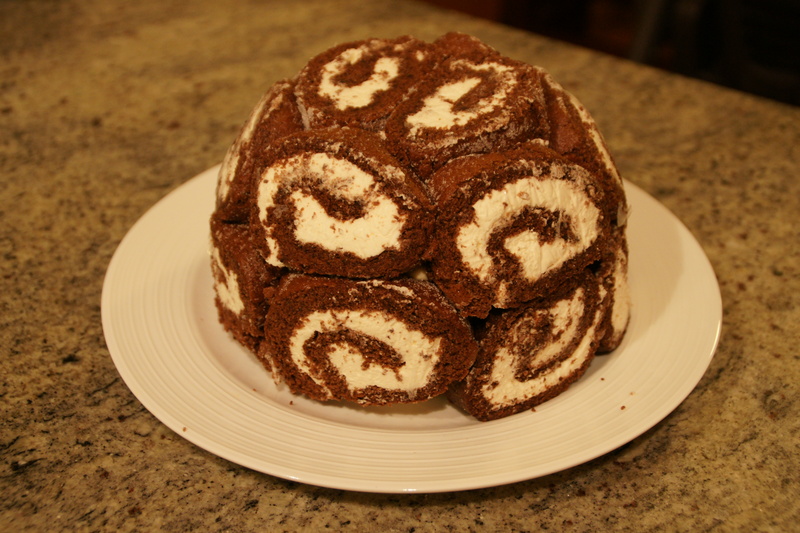 Cut the Swiss rolls into 20 equal slices ( approximately 2 cms each ).Cover the bottom and sides of the bowl in which you are going to set the dessert with cling film/plastic wrap.Arrange two slices at the bottom of the pan, with their seam sides facing each other. 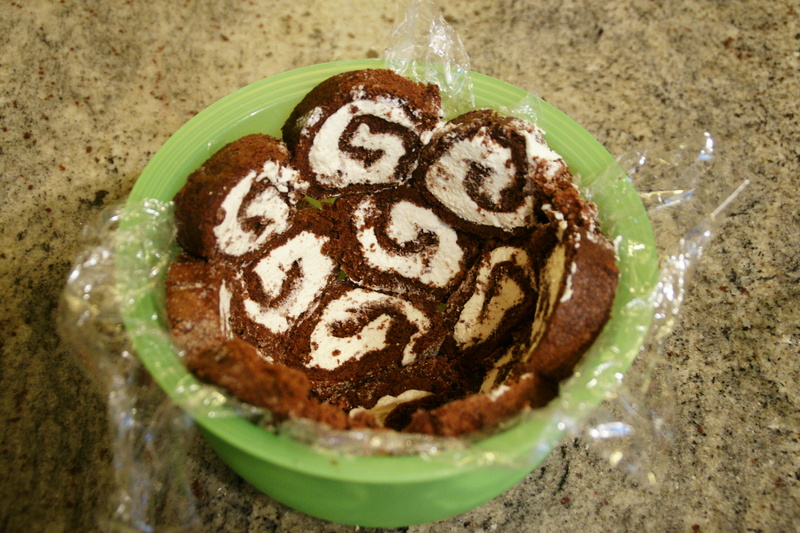 Arrange the Swiss roll slices up the bowl, with the seam sides facing away from the bottom, to cover the sides of the bowl. Cover the bowl with plastic wrap and freeze till the slices are firm (at least 30 minutes). Soften the first ice cream. 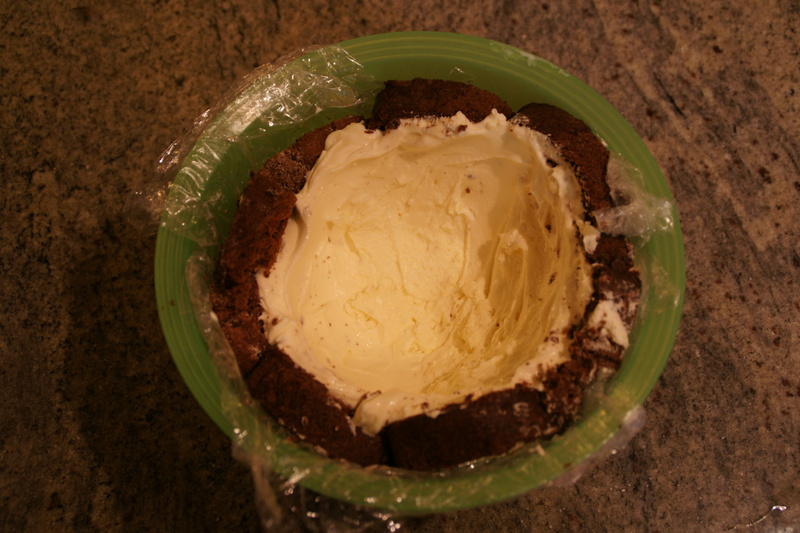 Take the bowl out of the freezer, remove the cling film cover and add the icecream on top of the cake slices. Spread it out to cover the bottom and sides of the bowl. Cover the bowl with plastic wrap and freeze till firm ( at least 1 hour). Add the caramel sauce over the sour cream ice cream, cover and freeze till firm ( at least an hour). 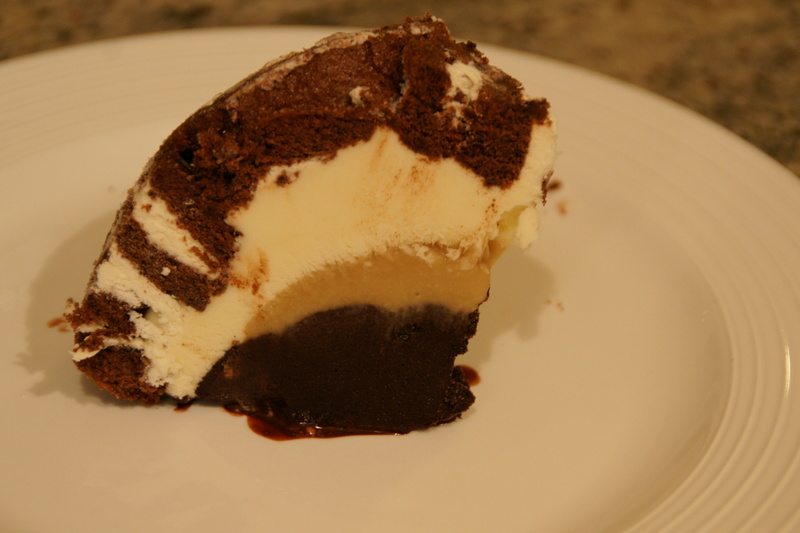 Soften the chocolate ice cream and spread it over the caramel sauce. Cover with plastic wrap and freeze for at least 4-5 hours till completely set. I found that the sorbet needed much more time to set – overnight worked well. Slice and enjoy (quickly as it melts!). Thanks Sunita for hosting this most enjoyable challenge. OH MY GOD. That is incredible. I’m drooling over the keyboard!!! Love those flavor combinations…I ‘ve made the chocolate sorbet before but never the sour cream ice cream..and brilliant addition with the caramel. This was definitely a challenge ! Nice job. And thanks for stopping by my blog ! I am a caramel freak and once I saw caramel, my mouth started watering..then sour cream ice cream to boot, along with chocolate sorbet. 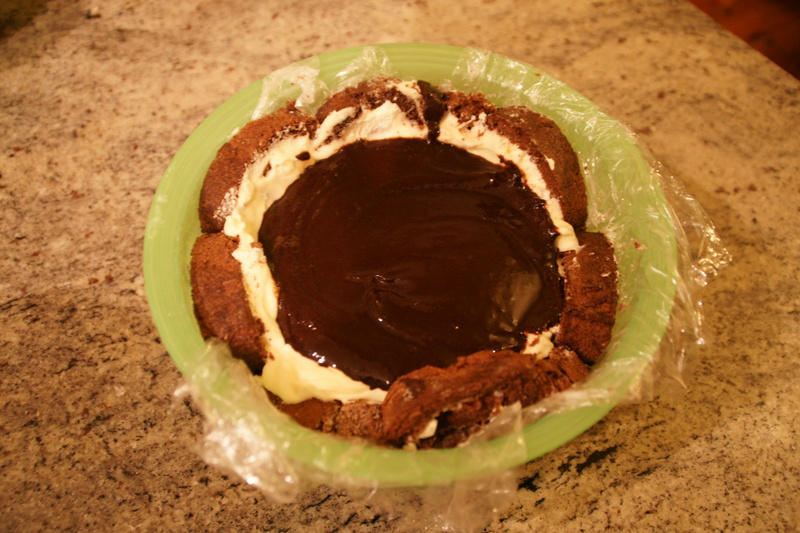 Wow..that is one beautiful and tasty bombe! Sour cream, cocoa, caramel..This sounds so good! I’ve been wanting to make that sour cream ice cream recipe too! Due to lack of an ice cream machine, it hasn’t happened, but I’m glad someone managed to try it.